The SSL Fingerprints on my Windows computer and the Mac computer I'm using do not match. I do not see a way to change these to match each other. Originally the SSL Fingerprint on the Mac showed something different. After uninstalling and reinstalling hoping to get an option to enter one it no longer appears. How can I resolve it? It seems that Synergy on both machines was not able to generate an SSL fingerprint. First, can you confirm that you wanted to use Synergy with SSL encryption switched on or off. I thought SSL made it more secure. That's why I chose to use that option. I've never had issues with configuring it with SSL encryption before. I unchecked SSL on both the Windows server and the Mac client and attached a screenshot from each. I'm not sure if you have stopped Synergy on both of your machines but we can try to turn it on again now that's turned off. But we might be better checking if both machines see and can actually communicate over that network. 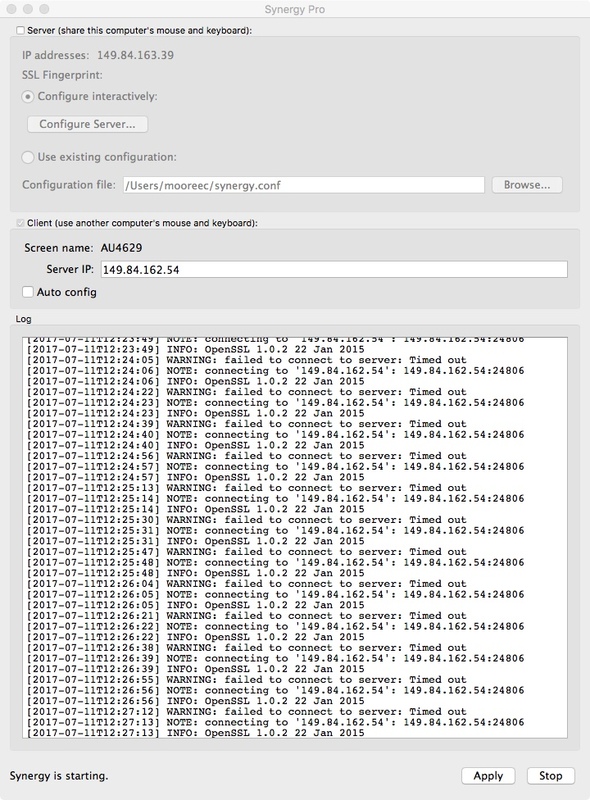 Try to ping your server's IP address from the client machine. Then do the other way around and send us a screenshot of each ping test. Proceed if they can both ping each other. Click the Stop button on each machine's Synergy interface. Then switch SSL back on but don't click Apply or Start. Just click OK for that change(s) you made to be saved. Then close Synergy interface on both. Give it 5-10 seconds, then relaunch/re-open Synergy. Make sure that an SSL Fingerprint is generated for both. Once successful, try connecting them again. Hmmm this must be where the problem is. 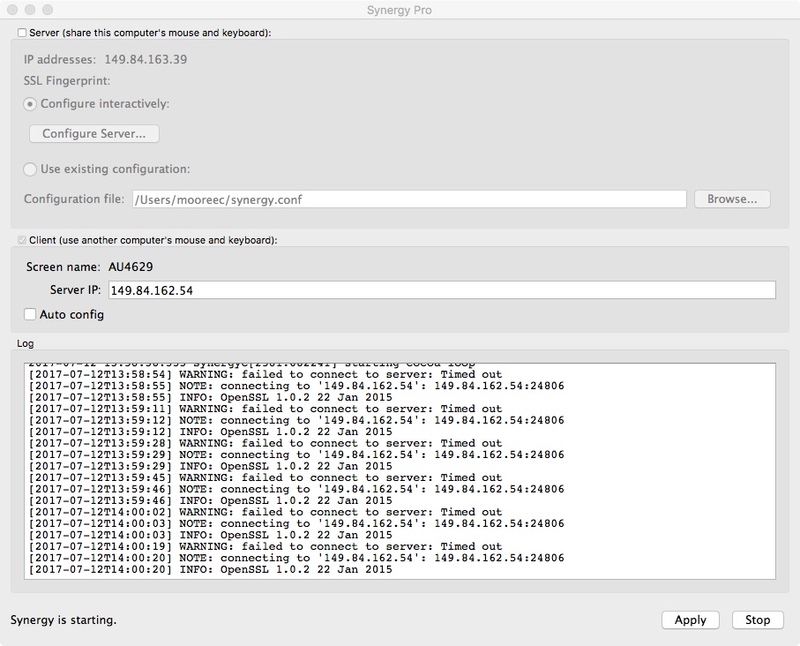 The Windows server can ping the Mac client, but the Mac client cannot ping the Windows server. I'm not sure why though. Both have IPs and previously communicated. 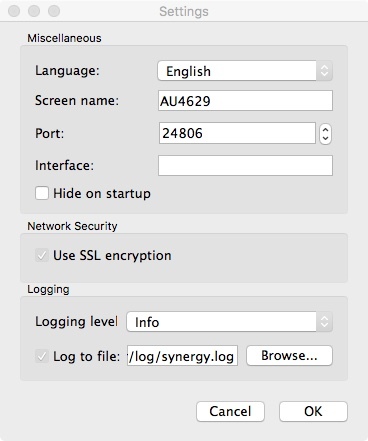 I've noticed in the past that certain versions of Synergy 1.x don't always clean up the ~/.synergy/SSL/ directory (may be under Library on OSX) and so you need to find and delete the directory to really reset the SSL certificates for the next time you open/install Synergy.